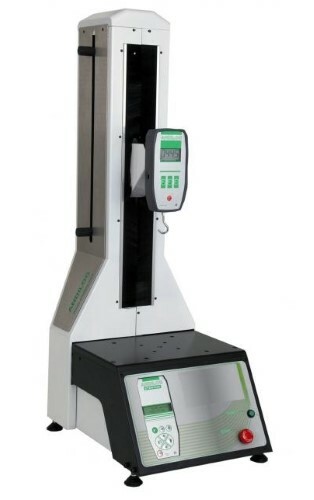 The Stentor First is a motorized test stand designed to carry out force measurement for all applications in which the displacement speed is specified by a standard, together with all applications in which the speed can have an influence on the measurement itself. The base supports a large worktable with easy access. Furthermore, fixing holes are provided to enable easy assembly of fixing tools. The force gauge is fitted on the mobile crosshead, actuated by a ball screw system. Displacement is carried out using a linear guidance system inside the test stand body. A system of adjustable mechanical or digital limit switches can be used to limit the crosshead travel to suit test requirements and protect the tools. Each limit switch has 2 functions: stop or reversal of direction for cyclical tests. The speed and displacement values are shown continuously on the console display. The Stentor First is available in 1000N version with a 200mm travel and un a 2000N version with a travel of 300mm. 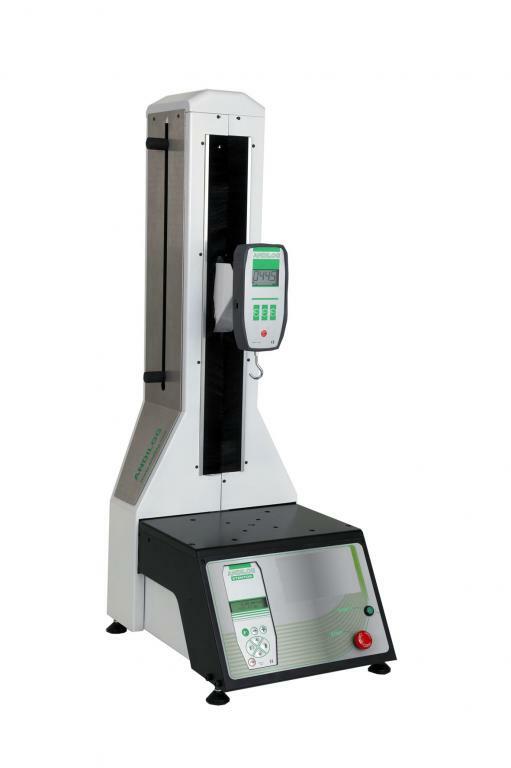 The force gauge Centor First is a simple and yet complete digital force gauge which uses efficient technology to simplify force measurements and tests in tension and compression. Supplied with its own carrying case, mains adaptor and certificate, ready for use, it is a basic force tester for quality and production. The Centor Easy R digital force gauge is designed to meet the production needs of its users. This force tester offers several features which are indispensable today for quality control : internal memory, RS232. For high capacities or when the measuring space is small, or to integrate the force sensor in a system, the Centor Easy R can be mounted with an external load cell to fit your needs.